Multiple pumps operating in complex systems can be synchronized and controlled by a computer. In this column, I will discuss several simplified cases, to give an idea of how pump system interactions are handled and what is involved. This column will also discuss how friction, static, and combination system hydraulics affect the system's results. First, a simple, single-pump system with friction but no static head portion is shown in Figure 1. The math is easy by adding the individual hydraulic coefficients because the flow is the same throughout the system. We could not do this as easily if the system had branches. This is why it is analogous to the electric circuit, the same current flowing from one component to the next results in different voltage drops across the individual resistors. In hydraulics, the pressure drop due to fluid flow is similar to the voltage drop. 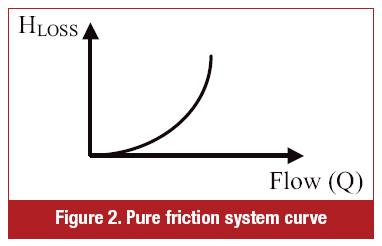 Once the KSYSTEM is calculated, a pure friction (no elevation component) system curve can be plotted. See Figure 2. 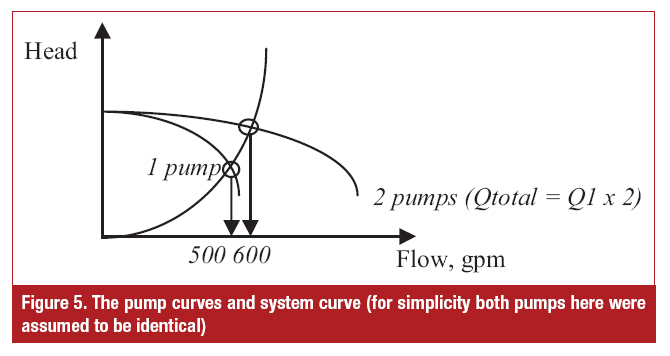 If the pump curve and a system curve are plotted together, an intersection determines the pump's operating point because it belongs to both curves as shown in Figure 3. 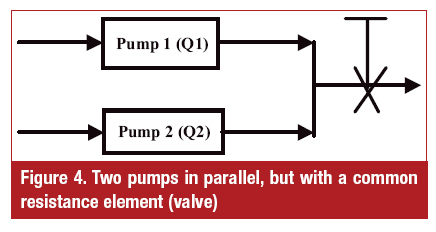 Next, we will take a look at two pumps in parallel as shown in Figure 4. Since QTOTAL = QVALVE, the combined pump curve and valve (i.e. 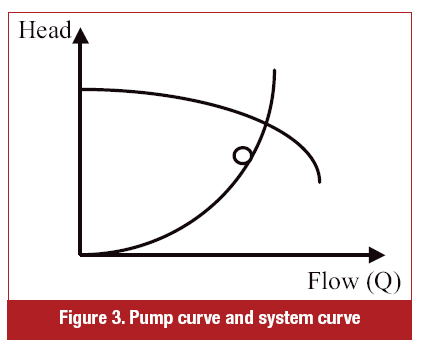 system) curves can be plotted, and the intersection determines the head (pressure) where the pump/system will operate as shown in Figure 5. When only one pump was operating, the flow was 500 gallons per minute (gpm). However when the second pump came online, they did not produce twice the flow, (1,000 gpm). Instead, only 600 gpm flows through the system. The reason is the shape of the system's resistance curve. However, if the pumps were pumping against mainly a static head (such as pressurized tank), then the flows would be additive. This is because the static head curve is not a parabola, but a straight line, independent of flow and parallel to the flow axis (Figure 6). In general, a combination of friction as well as static heads may be present, but one scenario is ususally predominant. In the previous example, the change of the valve setting (changing valve, K, coefficient) affects both pumps the same. However, what if the system is set up as in Figure 7? For simplicity, assume that the pumps and valves are identical and that each valve is throttled the same percentage (i.e. having the same coefficient "k"). Several points from the curves have been entered into Table 1.